I get to write about one of our favorite history resources! Oh, how I love everything from Heirloom Audio. 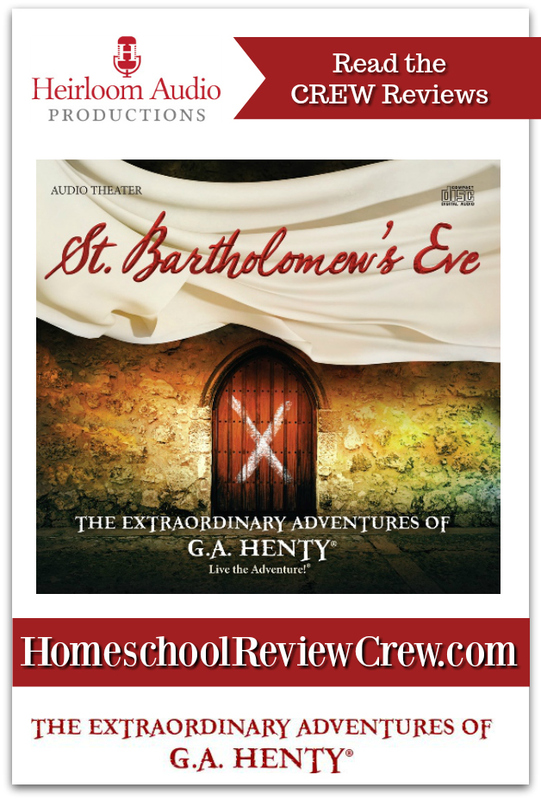 We have been blessed recently to get the opportunity to enjoy the phenomenal audio adventure called St. Bartholomew’s Eve. Do you want to make history edge of your seat exciting? Do you want to make family memories your kids will remember for a long time to come? Well, then you NEED to check out these audio adventures and specifically St. Bartholomew’s Eve. Heirloom Audio bases all of their work on the book series The Extraordinary Adventures of G.A. Henty. If you aren’t familiar with the stories you should make it a priority to learn everything you can about them. Every story is filled with the ideas and themes we want our children to emulate. Throughout the stories, you meet characters who are brave, loyal, courageous, and honest. They persevere through particularly tough circumstances. The company’s mission is “to engage the listener’s imagination by taking them back in time and immersing them in a great Christian story.” They do just that in the most (dare I say it) Extraordinary way. Every Heirloom Audio Adventure features the voices of well known Hollywood actors and actresses and a musical soundtrack that will rival the most elite Hollywood production. These stories are exciting and engaging. They are breathtaking and heart-stopping. These audios have become a part of the fabric of our family culture. They are played again and again and again and again and yes…. again. I’ll be replacing some of our first CDs before long as my kids are just wearing them out. Before we listened to St. Bartholomew’s Eve we knew NOTHING of the French Religious Wars. It was a series of events in our world’s history that I don’t believe I’ve ever heard of before. Our family talks often of Christians who are persecuted for their faith around the globe to this day. We’ve even helped organize prayer rallies at our state capitol and my husband has flown to Washington D.C. to protest and demand action from our government. The history of religious persecution should concern everyone. As it turns out, The French Religous Wars took place between 1562-1598. This was a war between the Roman Catholics in France and the Huguenots (like Protestants). My husband was raised Roman Catholic. He attended a private Roman Catholic school from Kindergarten through 8th grade. He was appalled yet not surprised that this little bit of church history had never been taught to him. Then again, he admitted, no church history was every really taught so…. I digress. Bet on topic here. There was a St. Bartholomew’s Day massacre in August of 1572. Many Huguenots and their leaders were lured to Paris to celebrate a royal wedding between a Catholic and a Huguenot. It was supposed to be an event full of hope for peace and reconciliation between the two religious groups. Instead, it was the kick off of weeks of assassinations and deadly violence at the hands of Catholic Mobs. This audio adventure tells you this story through the eyes of Huguenots. At the beginning of the story, we meet Francios and his cousin Philip. We begin before the massacres but just as the two are learning just what is truly happening to fellow Huguenots who are being persecuted and executed by the French Nobility and Roman Catholics. They must decide what they can do to help those most at risk and protect themselves. As we learn, the entire war was begun over the right to practice one’s faith freely and according to conviction. The Roman Catholics are horrified over the Huguenots differing style of worship. They believe the Huguenots are unholy for eating meat on Fridays and for honoring the King of Kings over the Royal King of the country. The Catholics do not like how Huguenots sing Psalms because this means that everyone can worship, not just priests. Francios and Philip decide that it is their duty to protect and aid anyone being persecuted for their faith and therefore they join Count De Luc and his troops. They attack Leon and take the city. The Huguenots seem to be winning the war as the win battles and gain more troops. The fighting moves closer and closer to Paris it becomes unclear who will win. Both suffer losses and victories. Francios and a fellow fighter are sent into Paris to assess the situation. They find Huguenots worshipping in secret. Francois and the Count are captured. Philip and Pierre stumble up a young boy named Argento whose father was taken away because of their faith. Argento helps them find the nobility responsible for the Count and Francois and through some cunning work they are able to get the prisoners set free. The fighting in this story is fierce. If you have sensitive or very young children you might be wise to wait until they are older to listen to this story. Good people die fighting for one they believe. There is trickier deceit. It can be hard to wrap your brain around why one group of people would kill another simply because they want to worship God by singing Psalms. At times I was left shaking. My children, however, ate it up. Non seemed negatively impacted. But oh the conversations we had. I do a lot of… “can you imagine if you were this character or that character? What you think or feel.” This seems to help my children understand that this isn’t just an adventurous story they are listening to. This Heirloom Audio adventure is just as much a treasure as all of the others. They are stories that my family listens to again and again and again and again… and yes… again. And with each listen we pick up on details that we didn’t before. The music rivals that of a blockbuster action-packed movie. The voice actors are Hollywood stars. These are gripping, edge of your seat, please don’t make me stop listening, stories. But more importantly than any of that… they teach us the most important things in history that no one else has taught us. And they fill our minds with people heroes of amazing Godly character. Oh, the discussions my children and I have. Priceless… truly truly priceless. You can learn more about Heirloom Audio on their website, Facebook, Twitter, Google+, and Instagram. The entire Homeschool Review Crew have also been reviewing this audio drama, check out their reviews by clicking the banner below.